When it comes to preventing suicide, true breakthroughs are hard to come by. The overall rate of suicide in the U.S. has increased since the turn of the millennium, reaching a 30-year-high in 2016, according to the Centers for Disease Control and Prevention. And although there are many drugs and therapy approaches available for people with depression, less than half of people achieve any sustained remission. In recent years, though, doctors have found convincing evidence that low doses of ketamine, a drug used by doctors and veterinarians for its anesthetic properties and by sensation-seekers for its psychedelic effects, might represent an genuine advance in treating depression. A new study published in the American Journal of Psychiatry suggests that ketamine could also be effective as a fast-acting treatment to prevent suicide. In the study, depressed patients who got an infusion of ketamine reported rapid relief from suicidal thoughts—many as soon as a few hours after receiving the drug. Doctors recruited 80 clinically depressed volunteers who checked themselves into the New York State Psychiatric Institute to take part in a randomized trial. The volunteers, all actively having suicidal thoughts, received either the sedative midazolam (intended as a control) or a low-dose infusion of ketamine. The patients were then tracked for at least six weeks while they underwent a standard course of psychiatric treatment. By the first day and even hours in, more ketamine patients responded to their treatment and experienced fewer suicidal thoughts than the control group. Some of this was due to the drug improving people’s depression, but it also seemed to have a direct impact in relieving their ideation. Better still, this reduction lasted throughout the remaining six weeks, likely because of the added treatment they were getting. The improvement was so dramatic that the researchers decided to dose patients who failed to respond to midazolam with ketamine a few weeks into their regimen, and these patients showed similar improvement. 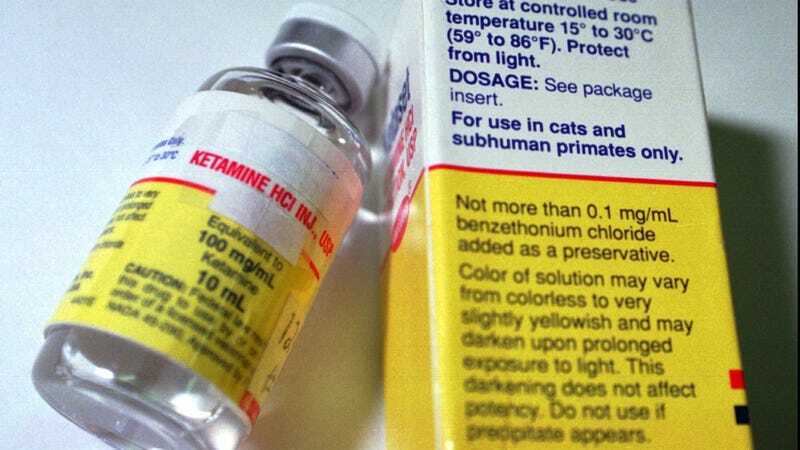 Ketamine’s effectiveness has been demonstrated in many, usually small, studies for years, with around 50 or 60 percent of people responding to it, Grunebaum said. But it isn’t a miracle drug. For example, while Grunebaum’s patients have been eager to try out ketamine, its effects are known to last only about a week. That makes regular treatment for a chronic disorder like depression inconvenient to say the least, since ketamine can only be given through a needle or catheter right now (nasal spray versions are in development). The drug is not currently approved to treat depression, though at least one ketamine-derived drug is chugging along the FDA approval process. There are still unanswered questions about its potential long-term side effects. When used in higher doses recreationally, ketamine is known to be hallucinogenic and potentially addictive. Frequent use has been found to cause memory problems, and heavy use can even cause coma and death. To that end, Grunebaum and his team are hoping to secure funding for a study that will let them scan the brains of ketamine patients, in hopes of gaining a better understanding of how exactly the drug is working to treat depression and reduce suicidal ideation. If you or someone you know is having suicidal thoughts, please call the National Suicide Prevention Lifeline at 800-273-8255 or text the Crisis Text Line at 741-741.